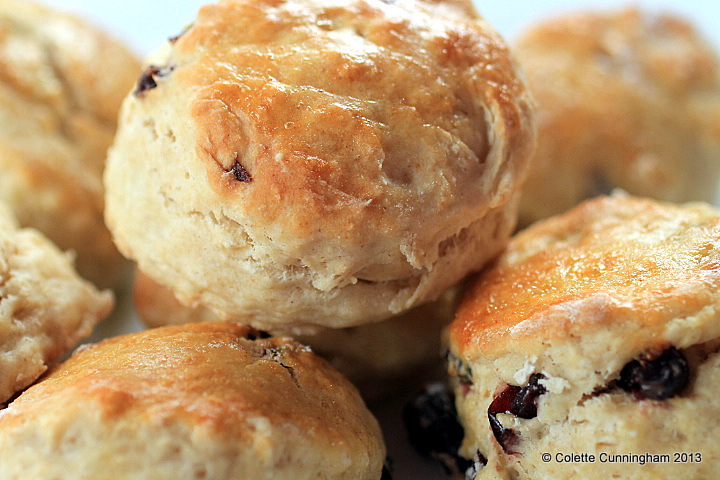 Scones are easy to make, and have endless potential for flavour combinations. They can be savoury, or sweet, and enjoyed at any time of the day. Here’s how to make my Dried Cherry and Vanilla Scones. These are not as sweet as you might think, with the inclusion of cherries, they are just sweet enough. Pre-heat the oven to 180°C/350°F/Gas Mark 4. Flour a large baking sheet. Sift the first 4 ingredients in to a large mixing bowl. Add the butter, and rub this into the dry ingredients, until it resembles breadcrumbs. Don’t worry if you miss some of the butter, this will melt while baking. In a separate bowl, or jug, mix the Buttermilk with the teaspoon of vanilla extract, and add this to the dry ingredients. Bring the dough together by hand, or use a wooden spoon. If it is a little dry, add more buttermilk, and if it is too wet to work with, add a little more flour. Turn out on to a floured board and form the dough by hand into a rough disc-shape, about 3 cm thick. Sprinkle the cherries over the dough, fold the dough a couple of times so the cherries become incorporated. Form the dough in to a disc again to about 3 cm thickness and cut out the scones. I used a scone cutter measuring 6 cm across, and this yielded nine scones. Brush each one with an egg wash – one egg whisked with a little water – and bake for 15 minutes (turning the tray 3 times) until browned on top, and cooked through. Previous Post Clichés! – Short Post! Oh my this looks very good!! Can’t wait to try it!! Thank you for your comment 🙂 Hope you like them if you do 🙂 Let me know how they turn out.